260 Byres Road, Glasgow. G12 8SH.Tel: 01413386511. This is one of around ten pubs in Glasgow that claim to be the oldest in the city. I have never seen any evidence of this as being the oldest however it is one of the oldest in the west end of the city. In 1858 the owner of the tavern was Mr James Sinclair he was also a coach hirer and manufacturer, when James died his wife took over the business. James Kay took over the licence soon afterwards, Mr Kay was born in Maryhill in 1838, he was married to Margaret and had a large family of seven daughters all living in Ruthven Street. 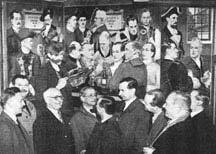 When John Green took over the pub in 1910 the rent for the premises was £55.00 per year. It stayed in the Green family for 60 years and was sold in 1970 for £160,000. Eric Green was the last of the Green family to own the pub. 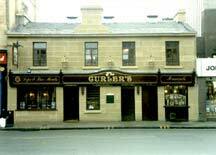 Curlers was bought by Tennents Caledonian Breweries in the summer of 1970, the interior was refurbished in 1972. The manager Vincent Paterson controlled staff of around 40. According to local folklore, the Curlers Tavern was opened in the seventeenth century as a coffee house. Later a licensed bar was started. It is said that Charles II called in for a refreshement and, discovered that the licence did not permit Sunday opening, granted a special Royal Charter exempting it from the Scottish licensing laws. However there is no record of this charter or any other evidence of this story. The public house took it’s name from the fact that a local curling pond which was in use until the end of the 19th century. 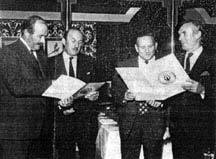 Opening of the new Log Cabin, Curlers Tavern 1950’s. 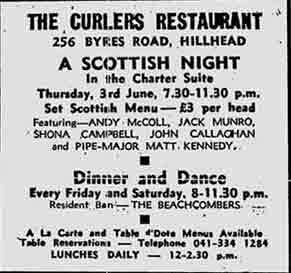 New dining area at Curlers Tavern in the 1950’s, manager then was Alexander Rutherford, licensee was Margaret Green. One of the murals being painted 1950.
left to right W Elliot, managing director of Tennent Caledonian Breweries, D Scott, managed houses director, R Ward, personnel director and R Paterson, director of licensed houses. 1972. Bing Crosby having a lager in a pub on Byres Road, probably Curlers Bar. 1976. 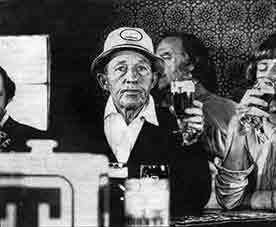 I have just been informed that it was not Curlers that Bing Crosby was having a pint but actually a still from an advert for Tennents Lager filmed at the Black Bull in Straiton, Ayrshire on 3 July 1975. Thank to Eoghan Baird. It has been called, rather unimaginatively, the reopening of The Curlers. But it would be more fitting to describe it as the re-emergence, or perhaps even the remaissance of this rather splendid old public house in Byres Road, Hillhead, Glasgow. And Byres Road as every native of the district and countless others less fortunate will readily admit, is this great city of Glasgow’s most fascinating shopping promenade, even it you don’t need anything. The Curlers, close enough to Glasgow University on one hand and the BBC on the other, fairly blooms in the sunlight of the two cultures. Blooming it certainly looks now with bright new white stonework setting off the fresh red woodwork to the best advantage. In fact, it’s now much more noticeble presence lends a distincive Swiss chalet touch to the already cosmopolitan air of the famous road. That’s only the outside. Choose the middle one of the three street doors and you reach the upstairs section of the sturdy, two floord building to see the impressive evidence of a modern miracle of transfermation. It’s a transformation that did not happen in a hurry. It took about 16 weeks of heavy, hard going and much ingenious planning to accomplish. Not to mention some £30,000. When you reach the top of the srairs, where you are almost certain to be greeted by the very alert and “with it” young manager Mr. Vincent Paterson, a preliminary glance will convince you it was £30,000 well spent. Proud as he is of his beautifully furnished and designed cocktail lounge which you reach first, Mr. Paterson is almost undisguisably impatient to dispaly the dining room. And “Isn’t it marvelous?” he asked me. Without waiting for my enthusiastic agreement he went on, “There isn’t anything like this in the country, or anywhere else for that matter,” he declared firmly. There are several unusual features in ther design and furnishings of this most appealing room which can seat 60 or 70 at a time. The most impressive for me were what at first glimpse seemed to be two scarlet and gleaming tents reminiscent of what might have been all the go with King Arthur’s Knights charging at the battle season. These two tents, with their extremely attractive scarlet drapings slung from a framework of shining tubular brass, are the dominant features of the room. Mr Paterson pointed out to me that one of the “tents” containing a small dance section rimmed on the floor with a broad circle of opaque glass. The other simply encloses a seating area. This painting of the Curlers Tavern came from the USA. Thanks to John Sloway. Vincent Paterson manager of Curlers Tavern 1972. 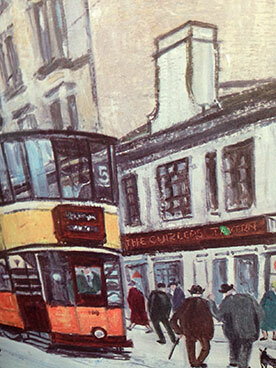 Part of Byres Road was called Victoria Street and Great George Street where the Curlers is situated. Byres Road only went as far as where the public library is today and veered west to Kirklee. 1993 William Keenan for Bass Inns.